Former US Army soldier Lonnie Simon Weig and his wife Rose. Picture from Facebook. A US Army veteran has been shot dead while while taking his regular early-morning jog in Baclayon town, on the island of Bohol. The body of Lonnie Simon Weig, aged 63, was discovered with two gunshot wounds to the head and one to the body on Sunday, January 21. Senior Inspector Raymond Halasan, chief of Baclayon Municipal Police Station, said investigations were continuing but no motive for the killing had yet been identified. The body of Mr Weig lies on a path where he was shot while jogging on Sunday morning. Photo courtesy of the Baclayon Municipal Police Station. Mr Weig was a US Army veteran from South Dakota who had lived in Barangay Laya for four years. 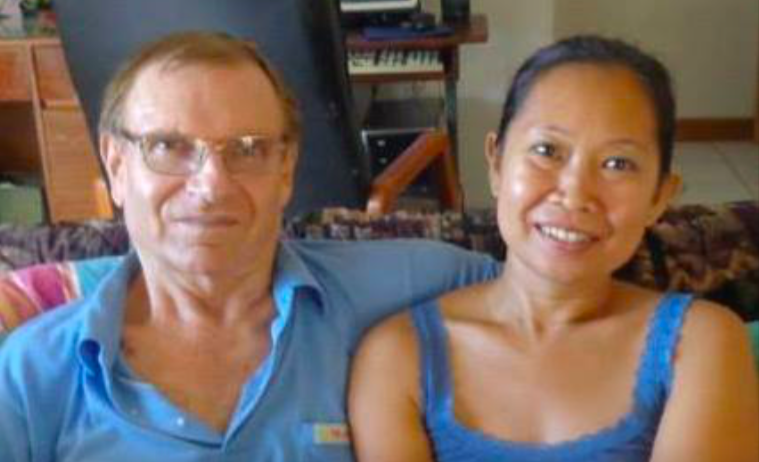 He was married to a Filipina, Rose, and they had three children together. Sr. Insp. Halasan said Mr Weig had gone out for his usual morning jog shortly after 5am when he was shot. He added that it was it was not yet clear whether the perpetrators were riding a motorcycle. The crime scene, an unpaved road surrounded by trees, was only about 500 metres from Mr Weig’s home. When questioned, none of his neighbours reported hearing any gunshots. However, a neighbour, who asked not to be named, told the Daily Inquirer that she heard the sound of motorcycles at dawn, which she thought was unusual. Police have dispatched a tracker team to hunt down the perpetrators. By all reports, Mr Weig maintained good relations with all his neighbours, and was not experiencing any domestic problems. According to our archives, the last foreigner shot dead on Bohol was Australian Martin Schlogloferm in August 2015. He was gunned down on his doorstep by motorcycle riding assassins. Looks like he was born 1 Sep 1948, age 69. Last lived North Dakota. Also lived many years in Hawaii. And seems to be retired Navy vice Army. Research done at ancestry.com. Anyway he was in the Navy in 1982, there is a photo. He could have changed services. Just delete my input, not important. All i can say is he did somethings sexually or he owed somebody money. Coz this just don’t happen. He pissed somebody off. Maybe he offended his wife’s family somehow, and they put the hit out on him. That’s just my two cents anyways. I lived in the philippines 10+ years, so i know what goes on there.